Construction has been underway all summer just south of the Sisters Post Office, as The Lodge in Sisters rises from the meadow. The senior living facility is well on its way to completion – reservations are available. After that, the facility must pass a state inspection, after which it can open. Hoover, who has a back-ground in financial planning, experienced first-hand the need for appropriate local care for seniors when his parents moved here from California to live across the street from Hoover and his family. He and his father were the sole caregivers for his mother as she declined in ill health. 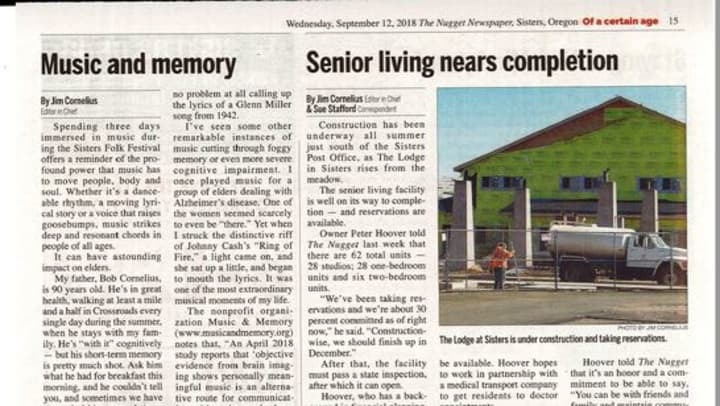 The intention for The Lodge in Sisters is to provide a quality, hospitable residence for both independent seniors and those requiring some assistance with their daily activities such as medication management. There will be no memory care of skilled nursing care available; however, there will be a full-time registered nurse on staff. For residents who no longer drive, transportation will be available. Hoover hopes to work in partnership with a medical transport company to get residents to doctor appointments. Interest in The Loge was immediate, as soon as plans were filed with the City of Sisters.. “We knew there was a desire and need for a facility but we’re stunned by the positive reception and enthusiasm we have seen.” Hoover told The Nugget earlier this year. More information is available at www.thelodgeinsisters.com. Hoover can be reached at 541-549-5634 or by email at THRIVIFYLLC@gmail.com.